hopefully you know what caused it and have to fix ceiling water stain. It’s most probably was a water leak from above such as a toilet or an overflowing bathtub or something of that nature. Another cause could be a leaking roof which would cost more than even replace the toilet. If you don’t believe it is any of the situations you don’t remember or know that there was no overflow of any kind and your roof is in good condition it might be a burst pipe summer is leaking. Just because you have a stain in a certain place on your ceiling doesn’t mean that is where the leak is originating from. You could have a pipe that is leaking from a totally different place and the water runs along the pipe and drops off at a certain point above your ceiling which means that the leak will not be directly above the water stain. Try to remember and be aware of when the stain happened. Did it happen after a rainfall? Or was the snow melting on your roof at the time of the leak. Is That Ceiling Water Stain Growing? Do you notice that the stain is getting larger and larger over a period of time? Is it possible that your shower stall or your bathtub is not sealed properly and waters seeping down between the tiles down through the floor to your ceiling below? 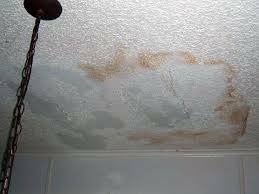 There is no sense in a fix ceiling water stain process or doing any kind of ceiling repair if you’re not sure that the cause of the water leak has been cured.